Citation Information: J Clin Invest. 2019;129(2):659-675. https://doi.org/10.1172/JCI123547. The aortic root is the predominant site for development of aneurysm caused by heterozygous loss-of-function mutations in positive effectors of the transforming growth factor-β (TGF-β) pathway. Using a mouse model of Loeys-Dietz syndrome (LDS) that carries a heterozygous kinase-inactivating mutation in TGF-β receptor I, we found that the effects of this mutation depend on the lineage of origin of vascular smooth muscle cells (VSMCs). Secondary heart field–derived (SHF-derived), but not neighboring cardiac neural crest–derived (CNC-derived), VSMCs showed impaired Smad2/3 activation in response to TGF-β, increased expression of angiotensin II (AngII) type 1 receptor (Agtr1a), enhanced responsiveness to AngII, and higher expression of TGF-β ligands. 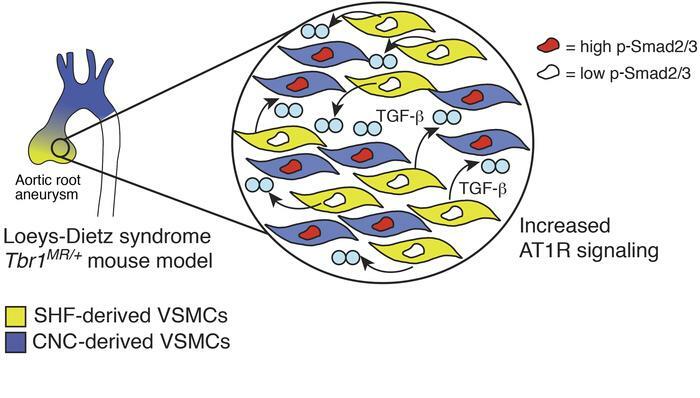 The preserved TGF-β signaling potential in CNC-derived VSMCs associated, in vivo, with increased Smad2/3 phosphorylation. CNC-, but not SHF-specific, deletion of Smad2 preserved aortic wall architecture and reduced aortic dilation in this mouse model of LDS. Taken together, these data suggest that aortic root aneurysm predisposition in this LDS mouse model depends both on defective Smad signaling in SHF-derived VSMCs and excessive Smad signaling in CNC-derived VSMCs. This work highlights the importance of considering the regional microenvironment and specifically lineage-dependent variation in the vulnerability to mutations in the development and testing of pathogenic models for aortic aneurysm. Model for aortic pathogenesis associated with Loeys-Dietz syndrome. In the Tbr1MR/+ LDS mouse model, a heterozygous kinase-inactivating missense mutation in Tgfbr1 (Tgfbr1M318R/+) associates with defective TGF-β signaling in SHF-derived cells, while CNC-derived cells retain normal signaling capacity. Defective Smad2/3 signaling in SHF-derived cells associates with upregulation of Agtr1a gene expression, and AT1R-dependent overexpression of TGF-β ligands. In the presence of increased levels of TGF-β, CNC-derived cells show increase levels of p-Smad2/3, which contributes to pathogenesis. Treatment with the AT1R inhibitor losartan and CNC-specific Smad2 ablation ameliorates disease. Additional cell types, such as adventitial fibroblasts, endothelial cells, and recruited immune cells might also contribute to increased TGF-β expression and/or activation at sites of disease.